Compare prices from several car hire companies in Ponferrada and find the best price for car rental. Our prices always include unlimited mileage and insurance. Ponferrada is located in northwestern Spain and belongs to the region of Castilla y León. Léon is the name of the province and the province’s capital city of the same name is located about 100 km east of Ponferrada. The town is built at the confluence of the rivers Sil and Boeza, and in 2010 the number of people estimated to be nearly 70 000. 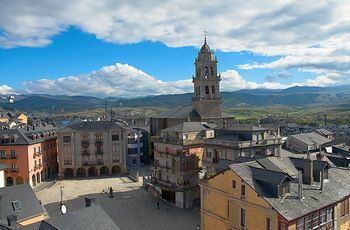 Ponferrada is known for being the last major town along the pilgrimage route of Camino de Santiago, or Way of St. James, before landing the city of Santiago de Compostela. The route has existed for about 1000 years. In Ponferrada there are many historic buildings, including several churches and a castle. The nearest airport is Leon Airport which offer flights to cities like Barcelona, Alicante, Malaga and Madrid. The airport is located approx. 100 km from Ponferrada.